This splendid town, which thanks to its artistic and architectural vestiges, has been called the "Pearl of the sixteenth century", conserves all its original beauty intact. On climbing up through the steep quarters, visitors can discover magnificent palazzos and churches where the most famous architects of the renaissance period left testimonies of their unequalled art. Not to be missed, splendid Piazza Grande, the Duomo with its unfinished façade, and Palazzo Comunale; all surrounded by renaissance palazzos. In the valley lying below the town, in an unforgettable setting, the elegant shape of the Temple of San Biagio. 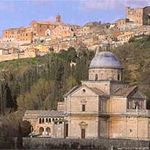 Montepulciano is also a centre of fervent cultural activities. Among the most renowned events, the "Cantiere Internazionale d'Arte" (International Art Workshop) and the popular manifestation of the "Bruscello". The important farming economy is flanked by a thriving tourist industry with one of the main attractions being the Terme di Montepulciano, in the locality of S.Albino, where the therapeutic properties of the waters and mudpacks can be exploited to the full. Pienza is a small town of the Sienese, and it's a rare example of Renaissance town planning. Pienza is defined the "ideal town", the "utopia town", and it represents nowadays one of the most concrete method construction through which in Renaissance age they tried to realise a model of life and an ideal government on earth, working out an idea of town able to give concrete answers to the desire of civil, pacific and laborious coexistence between man. It was the "utopia of civitas" vainly pursued by ancient time men. 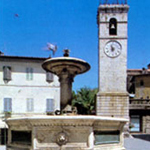 Already extremely important in Etruscan times, Chiusi experienced its period of maximum splendour during the era of the legendary King Porsenna. Important findings, the results of archaeological excavations which are still successfully carried on, can be viewed in the "National Etruscan Archaeological Museum". Standing in front of the museum is the Duomo, already existing in the twelfth century and transformed in 1585. The Cathedral Museum, erected next door in the thirties, conserves important findings including precious engraved missals. Etruscan tombs have also been brought to light here, like the Scimmia, Leone, and Pania tombs and many others as well. Christianity spread through these areas very quickly as testified to by the Catacombs of Santa Mustiola and Santa Caterina. Apart from the catacombs, the "Labyrinth of Porsenna" can also be visited with its intricate underground tunnel system that leads to the Cistern dating back to the first century BC. 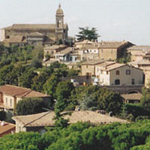 For all these reasons, and also thanks to its considerable natural beauty, Chiusi is rapidly developing its own tourist vocation. Another important attraction is represented by the Lake of Chiusi, downhill from the city, a tranquil mirror of water where it is possible to go competition fishing. Long before numerous 20th-century celebrities chose this region as fashionable for their trips to Tuscany, Neanderthal Man appreciated Cetona's aspect. The slopes of Cetona's mountain have long been home to caves and underground passages comparatively well-suited to living and raising a family. 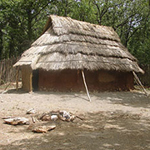 This museum is an unmissable stop to learn about the region's various phases of human population. Tools formed from chipped rocks, remains of animal prey and a large number of archaeological pieces demonstrate the continuity of human settlement throughout the territory. This small but packed museum has been recognised for its very effective educational presentation, taking visitors on fascinating journey back through time. 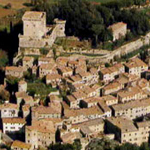 The town of Sarteano grew up along a strategic ridge rising above the Valdichiana valley and its imposing 10th century castle is a clear indication of the town’s mediaeval origins. It has many splendid buildings and churches; of particular interest and worthy of a visit is the church of San Martino in Foro which houses the Annunciation painted by Domenico Beccafumi the most important siennese painter of the 16th century. 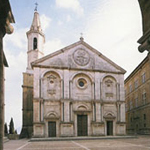 The collegiate church dedicated to saints Lorenzo and Apollinare also houses several excellent works of art. Other buildings of note are the Palazzo Comunale (Town Hall), Palazzo Piccolomini, Palazzo Goti-Fanelli and Palazzo Cennini. The small but charming theatre, Teatro degli Arrischianti, is also well worth a visit as is the Museo Civico Archeologico which houses numerous Etruscan and Ancient Roman artefacts found locally. Every year, on the 15th of August, an exciting jousting tournament of mediaeval origin the “Giostra del Saracino” is celebrated. 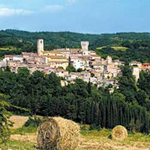 The fortified Abbey of Spineto and the hamlet of Castiglioncello del Trinoro are only a few kilometres from the town. 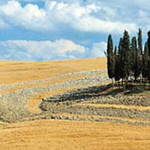 Montalcino is situated 564 meters above sea level on the top of a hill dominating the Orcia, Arbia and Ombrone valleys. As you walk round the town you can admire magnificent views as well as the fine mediaeval buildings which include; the town hall Palazzo Comunale – once the seat of the Priorate – a severe stone building decorated with coats of arms with a tall tower rising above it; monumental 14th and 15th century open galleries with their gothic arches; the neo-classic Cathedral built on the site of an 11th century parish church which houses an interesting collection of sculptures in the Baptistery Chapel; the 17th century Sanctuary of the Madonna del Soccorso built on the site of a 15th century church of Porta al Corniolo; the Romanesque – Gothic style church of Sant’Agostino, the church of Sant’Egidio (also known as the “Chiesa dei Senese” - the church of the people of Siena) built in the early 14th century; San Francesco with its square tower. The Civic Museum which houses a della Robbia terracotta dated 1507 showing a Madonna and child with Saints Giovanni and Pietro; the church of San Sebastiano with another 16th century della Robbia terracotta. The Museo Archeologico which houses finds from the Palaeolithic, Neolithic, Bronze and Iron Ages, cinerary urns and Etruscan pottery. The Museo Diocesiano which houses an early 18th century Romanesque crucifix, part of a polyptych by Luca di Tommè and a Madonna and child from the school of Duccio di Buoninsegna. This tiny centre, located at the southernmost end of the province of Siena on the boundary between Umbria and Lazio, was already famous in medieval times and to today's visitor it looks just like a typical medieval hamlet dominated by the massive square tower of Palazzo Bologna. Not to be missed, the historic centre, a typical hillside settlement, with its narrow streets, alleyways and piazzas. Outside the historic centre, in the vicinity of the Thermal Spa, is the very interesting Basilica Church dating back to the year one thousand. However while San Casciano, immersed in a luxuriant and uncontaminated nature is an attraction for visitors who prefer rural holidays, we mustn't forget that the majority of tourists come here for thermal cures, like inhalation, baths and mud therapies. Just a few kilometres away is the tiny hamlet of Celle sul Rigo, with its majestic thirteenth century tower and an unforgettable panorama. Tourists visiting this spot mustn't miss out on tasting the delicious local produce. Today Val d'Orcia is peripheral, a land fresh and unspoilt where the character of its agricultural economy and the persistence of the inhabitants to works the earth and the natural materials found in the area, have safeguarded the relationship between man and the environment. The scenery of the Val d'Orcia, which begins with a symmetry of natural harmony with its soft rolling hills, changes into the majestic grandeur of the Amiata, a mountain abounding with springs of crystal clear water and luxuriant vegetation. The colours of dry clay, and golden earth, share the hills; dark green moss and undergrowth cover the base of rocky crags and old farm houses; the gentle colours found in the orderly lines of vineyards mix with the silver grey of the olive groves. The solitude, the empty spaces, the light, the views, conjure up a sense of pleasure, delight and even loneliness difficult to define. The Val d'Orcia is a landscape of never-ending hills, interspersed with torrents, ravines, rugged outcrops, river banks which intertwine until they are lost in the ash colour of the distant Crete. The roads Francigena, winding among this natural but hostile beauty throughout the centuries, has contributed towards the growth of the small centres and the pride of an ancient people, accustomed to sharing the dreams, arrogance and the Utopia of powerful and famous men.